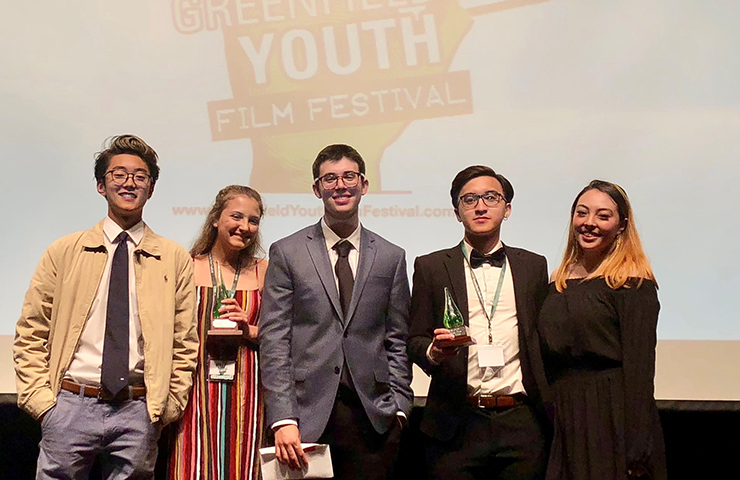 George School students took home awards at the Greenfield Youth Film Festival on Wednesday, April 25, 2018. The festival gives high school students in the Philadelphia area an opportunity to showcase their work, collaborate with peers, and connect with industry professionals. Award categories at the festival included: narrative, documentary, experimental, screenwriting, editing, lighting, cinematography, special effects, and more. Quan Do ’18 and John Fort ’19 won Best Music Video for their project Sapphire Eyes. Maddie Keith ’19, Shumpei Chosa ’19, and John won Best Documentary for their project Agents of Change. Quan Do attended the festival with classmates two years ago and shared that seeing George School seniors win prizes was a strong motivation for him. Last year, his film was nominated for best cinematography, and this year another film of his was nominated in nine categories. Winning the prize for Best Music Video with his peers and letting their creativity thrive was truly a memorable experience. The original score of the music video was produced by Will Vamos ’18, who sings and plays piano throughout the music video. Messiah Williams ’18, Will Street ’18, and David Mark ’18 also performed and recorded the song Sapphire Eyes. Maddie shared that creating Agents of Change helped her to branch outside of her comfort zone. Her project group was inspired by Scott to create a documentary about the fall theater production of The Night Thoreau Spent in Jail. The documentary allowed the audience to see the play through the eyes of the production crew. The group hopes that people feel inspired to make a change in their community when they watch the documentary. “I hope that they feel inspired to not be afraid to express views and beliefs different from societal norms,” said Maddie. Read more about the Greenfield Youth Film Festival.